Thanks to Scott Marshall for providing this extremely informative article from International Projectionist published in July, 1954. Perspecta, for those unfamiliar with it, was an optical sound system that created an ersatz stereophonic effect from a monophonic soundtrack. This system was initially promoted by Paramount Pictures Corp. in conjunction with its VistaVision photographic process. While it is often stated that the compatibility of the Perspecta system benefitted exhibitors because it was less costly than a magnetic sound system, the actual equipment and installation costs were not substantially different. With the exhibitor the primary cost savings would lie in not installing auditorium speakers since Perspecta sound was limited to directional information in the stage channels only. In fact, Perspecta would be attractive primarily to theatres that had already installed a full magnetic system. Cost savings were very real to producers and distributors since it was not necessary to have magnetic stripes added to final prints. At the time Perspecta was initially introduced, the compatible magoptical soundtrack had not yet been developed. While Perspecta "stereo" sound may have been able to provide effective directional effects, it was not able to equal the frequency response, dynamic range, and improved signal to noise characteristics of magnetic systems since it utilized the optical recording standards created two decades before. It was able to generate an increase in dynamic range through amplification of the soundtrack. Perspecta sound system was used extensively by M-G-M and Paramount, with a few Warner Bros and Universal films also mixed in the system. Perspecta sound was introduced in 1954 and the last films made in the process were released in 1957. One last note before we go to Mr. Fine's article: Despite Paramount's support of Perspecta, it did not mix the audio of all VistaVision films with Perspecta encoding. The article is very enlightening. Thanks, Scott. With the introduction of widescreen techniques and the warm acceptance by the public of these dramatically more effective pictures, a problem was posed as to the enhancement of these presentations through the use of directional or stereophonic sound. The first of these pioneering efforts in stereophonic sound quickly answered the question as to the distribution of stereophonic sound with a larger picture presentation. It was overwhelming; yet it proved that both direction and volume enhancement with the enlarged picture added tremendously to the effectiveness of the overall subject material. Several systems have been used, each of which possesses advantages and disadvantages. In an effort toward industry standardization, as well as minimizing costs for producers and exhibitors, Perspecta Stereophonic Sound was developed. The development was based upon observations of what constituted stereophonic sound as we heard it in the theatre and how it could be achieved through the use of standard or non-recording mediums in such a way as not to limit the use of the product only to theatres equipped with special devices for reproduction. It was obvious that magnetic-striped film could not be played in a theatre without the proper type of reproduction heads and that it would be necessary in a general run of a double feature with associated short subjects and newsreels for the projectionist to be constantly aware of the type of product so that he could switch between magnetic and standard optical reproduction, creating somewhat of an operational problem. Also, this product could not be distributed as before because of the need of special equipment, thus a theatre equipped for magnetic reproduction was limited to fewer sources of product. The development then narrowed itself down to creating an optical track that would be completely compatible encompassing some form of information or that if used with the Perspecta Stereo Integrator equipment (Fig. 1) it would reproduce with all the advantages of stereophonic sound both in quality and direction, and that if the same track were run on a standard projector in an average theatre it would reproduce as a standard single-channel normal optical track. There have been many comments and discussions as to the merits of optical vs. magnetic track. With much misinformation circulating, there exists general confusion. There is no doubt that optical track can efficiently encompass the frequency range necessary to create lifelike reproduction of sound through the Perspecta stereo system. If the optical track can be properly reproduced, it is generally almost impossible on an audience level to differentiate between Perspecta sound and any 3- or 4-stripe magnetic system. Here again it is necessary to keep in mind that this same track is completely compatible and can be played either as a single standard track or in conjunction with the Perspecta stereo sound Integrator as stereo reproduction. the Fine Perspecta sound reproducing system. The Perspecta system utilizes a single optical soundtrack. In addition to the audible sound, three sub-audible low frequency control signals are recorded. The variance in amplitude of each low-frequency control signal controls the volume of reproduction through the corresponding amplifier horn channel. 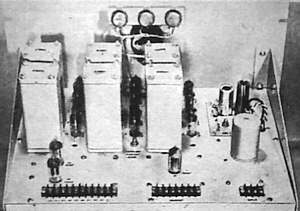 Initial tests indicated that it was possible to introduce low-frequency controlling signals recorded simultaneously, with the relative complex waveforms, and still maintain quality audio, and at the same time leave sufficient energy of the controlling signals to operate over a wide range of volume control. It was then necessary to ascertain the maximum low-frequency level that could be used without sacrificing compatibility or introducing intermodulation distortion. The maximum amplitude of any control frequency shall not exceed 16 db below a 100% constant tone level based on area film recording with 76 mil peak-to-peak voltage. There is a test reel that incorporates a series of test signals to align the Integrator equipment, consisting of combinations of control signal and 100% tone modulation at a 16 db differential. This calibration represents the maximum reproduction volume level control that would be apparent in the theatre when the control signal reaches this 16 db point. In mixing or scoring the film, to allow for the normal dynamic range of the film track, it was found desirable to set the average mixing control signal amplitude 5 db below its maximum level or at approximately minus 21 db with reference to 100% tone. This allows leeway for dynamic enhancement beyond the limitations of the optical recording for effects and music sequences. It should be emphasized that Perspecta stereo sound is not a switching system. Continuously varying amplitudes of control govern the output level of each of the three horn channels, thus giving an extremely smooth directional effect without jump between channels. In the final release track, then, the average amplitude of any of the control signals does not exceed 21 db below 100% tone, except for effects or music sequences, thus insuring a greater compatibility of the Perspecta release track. The generation for the control signal, as installed at M-G-M, Warners, and Paramount, consists of three master oscillators, the frequency of which is set with the use of precise observations on an oscilloscope against the 60 cycle line frequency. Integrator Unit of the Perspecta sound system. It incorporates a pre-amplifier with enough gain to accommodate any type of output level from any type of projector. The output of this pre-amplifier is fed into two filters. On the audio side, a 63-cycle, high-pass filter system and booster amplifier feeds a buss connecting to the inputs of the three controlled push-pull stages, so that the same audio signal is available at the input of each of the three controlled amplifiers. A great deal of engineering has been done to reduce the size of the low frequency units. They have a 2-cycle bandwidth, to allow for variation of up to 4% in the speed of the projector. At the same time, the filters produce a 20 db rejection at the 5-cycle point between each of the channels to give adequate separation between control channels. Each of the low-frequency control signals after acceptance by its corresponding band-pass filter is again amplified and sent through an appropriate coupling to a diode rectifier system. The amount of rectified voltage appearing on the output of the diode rectifier sections is linearly equivalent to the amplitude of the low-frequency control signal that was introduced to the input of the band-pass filter. It is obvious, therefore, that the unit operates on a 1-to-1 ratio through its controlled range. Simply expressed, this means a 1 db change in output level of the controlled push-pull amplifier section. This insures a smooth change in volume when changing directional characteristics by variance of control signal amplitude from one band pass section to another. The presence of any control signal of normal amplitude for a period in excess of 7 seconds activates a relay system which connects the output of each of the rectified components of the low-frequency controlling signals, to control the bias of its corresponding push-pull controlled amplifier stage. Absence of all low-frequency control signal for 1 1/2 seconds causes the auto-switching unit to deactivate the system. Under this condition, a bias equal to the cut-off value of the push-pull stages is applied to the two outside channels, thus desensitizing them by approximately 25 db. Simultaneously a fixed bias can be adjusted at the unit to insure a correct level balance between Perspecta stereo sound operation and monaural or normal film track operation. The value of bias will be supplied to the center controlled amplifier section. This insures the compatibility of the Perspecta stereo sound Integrator Unit, so it automatically presents either standard optical track or Perspecta stereo sound optical track, correctly in each case, and the projectionist need not be concerned as to the type of optical track running through the sound head. If, in a rare instance, a track is played for non-Perspecta stereo sound reproduction that contains an abnormal amount of low-frequency energy for extended periods of time that may cause the auto-switching circuit to operate, there is provided, on the front panel of the unit, a switch which will manually deactivate the auto-switching system so as to insure no interruption of the normal performance during this abnormal situation. There is an indicator light on the front panel of the Integrator unit that indicates when the auto-switching circuit has changed to Perspecta stereo sound operation. The installation of the Integrator in the theatre is a relatively simple procedure. The output of the changeover switch is connected to the input of the Integrator, which is equipped to provide adjustment to accommodate the variances in level at this point in different types of systems, .i.e., the RCA low-level system or the Westrex high-level, preamplifier system. From here on, with the switch set for automatic operation, the projectionist need not be concerned as to whether he is playing a picture scored with Perspecta stereo sound or a regular soundtrack. As noted previously, if there is Perspecta stereo sound scoring on the sound track for 7 seconds, the unit will automatically switch into Perspecta stereo sound 3-channel operation and remain in this position for the duration of that sound track. When there is no low-frequency control present, the unit will not be activated and the sound will be channeled through the center horn system. The 30-cycle filter controls the volume level of the left horn system as seen facing the stage. The 35-cycle filter is for the center horn system. The 40-cycle filter is the control for the right-hand horn system. In scoring a picture for Perspecta stereo sound, a composite soundtrack is generally used for making the final recording. The track is run synchronously with the picture and monitored through an Integrator Unit so that all changes in carrier amplitude, with their resultant directional changes, can be observed by the mixer simultaneously with the combination of the control signal and audio tracks for the final release track. After the optical track is made, incorporating the control information, it is interlocked with the picture again to check mix and direction. When approved, the final release composite print is made. This technique follows lines well established within the industry. The Integrator unit with its corresponding power amplifier and horn channels, is the only addition necessary in the theatre. A general plan for installation has been hit upon that fulfills completely the requirements of the average theatre based upon experience with the Loew’s theatre installations. These houses were equipped with penthouse reproducers and stereophonic channels with magnetic reproduction; also they were equipped for standard optical reproduction through a separate set of amplifiers with the addition of an Integrator unit which would reproduce through their stereophonic power amplifier system from the standard optical head system. THE FIRST POSITION is labeled "Standard Optical": when in this position the output of the soundhead is fed through the normal optical channel that has always been in the theatre to the center horn and is used more or less as an emergency system. THE SECOND POSITION is labeled "Magnetic": this connects the output of the penthouse reproducers to the equivalent stereophonic power amplifier channels through the ganged fader. THE THIRD POSITION is labeled "Perspecta Sound": this position connects the output of the optical soundhead to the input of the Integrator and the output of the Integrator through the ganged fader system to the stereophonic power amplifier system. With the switch set on "Perspecta Sound", the projectionist need not be concerned as to his newsreel and short-subject program reproduction because, as outlined previously, the Integrator will switch from stereophonic reproduction to center horn reproduction automatically based on whether the program is scored for Perspecta stereo sound or standard film. In the field tests that now have been running for 5 ½ months throughout the world, there has been very little or no difficulty encountered in most installations and runnings. In theatres having no regular service organization, the projectionist need only run the Calibration Reel once a week or so just to check the over-all operation of his soundheads from a sensitivity standpoint, and get indication as to exciter lamp brightness and balance between projectors. Under general operation there is no need for any particular service to the Integrator unit itself. It is a stable, well-engineered device, and should prove trouble-free for extended periods of time.